In the sixth month the angel Gabriel was sent from God to a city of Galilee named Nazareth, to a virgin betrothed to a man whose name was Joseph, of the house of David. And the virgin’s name was Mary. And he came to her and said, "Greetings, O favored one, the Lord is with you!" And the angel answered her, "The Holy Spirit will come upon you, and the power of the Most High will overshadow you; therefore the child to be born will be called holy — the Son of God. And behold, your relative Elizabeth in her old age has also conceived a son, and this is the sixth month with her who was called barren. For nothing will be impossible with God." And Mary said, "Behold, I am the servant of the Lord; let it be to me according to your word." And the angel departed from her. The "sixth" month refers to the pregnancy of Mary's relative, Elizabeth, who is carrying John the Baptist. Elizabeth is often referred to as Mary's cousin, but the exact family relationship is unknown; she was much older, since she was past the age of childbearing. Mary was betrothed and thus almost certainly a teenager, as young as 13. From the tone of the passage, it seems the young virgin handles the appearance of Gabriel with a good deal more aplomb than Zecharias had. She seems simply to accept the message; she was truly, by this first meeting and by all accounts in the Bible, a faithful servant of God. We don't learn much in the way of detail about Mary's pregnancy. Most of us assume that her parents and community simply accepted her story, which would show a degree of faith and acceptance of God's interaction with human life that would be almost unthinkable today. Imagine your engaged teenaged daughter telling you that God had made her pregnant! (Or your neighbors telling you such a tale about their daughter.) Not to mention, that an angel had materialized in her bedroom to inform her and that the child would be the "Son most High". 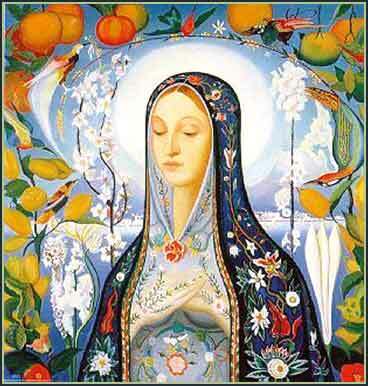 But we do believe it about Mary, even in this skeptical day and age, perhaps because we have the benefit of hindsight. We know that the child actually will be the son of God, the most remarkable man in history who will defeat death itself. And once we make the step of believing in Christ, the Annunciation and virgin birth become easy to believe.